Jailbreaking is the process by which full execute and write access is obtained on all the partitions of iOS, tvOS and watchOS. It is done by patching /private/etc/fstab to mount the System partition as 'read-write'. This is entirely different from an unlock. Jailbreaking is the first action that must be taken before things like unofficial activation (hacktivation), and unofficial unlocking can be applied. Older jailbreaks also included modifying the AFC service (used by iTunes to access the filesystem) to give full filesystem access from root. This was later updated to create a new service (AFC2) that allows access to the full filesystem. Modern jailbreaks now include patching the kernel to get around code signing and other restrictions. These are called Kernel Patches. Note: The legality of jailbreaking your device varies with each country/region. Wikipedia has a summary of legality for some countries. When a device is booting, it loads Apple's own kernel initially, so a jailbroken device must be exploited and have the kernel patched each time it is booted up. An untethered jailbreak uses exploits that are powerful enough to allow the user to turn their device off and back on at will, with the device starting up completely, and the kernel will be patched without the help of a computer – in other words, it will be jailbroken even after each reboot. However, some jailbreaks are tethered. A tethered jailbreak is only able to temporarily jailbreak the device during a single boot. If the user turns the device off and then boots it back up without the help of a jailbreak tool, the device will no longer be running a patched kernel, and it may get stuck in a partially started state, such as Recovery Mode. In order for the device to start completely and with a patched kernel, it must be "re-jailbroken" with a computer (using the "boot tethered" feature of a tool) each time it is turned on. All changes to the files on the device (such as installed package files or edited system files) will persist between reboots, including changes that can only function if the device is jailbroken (such as installed package files). In more recent years, two other solutions have been created - semi-tethered and semi-untethered. A semi-tethered solution is one where the device is able to start up on its own, but it will no longer have a patched kernel, and therefore will not be able to run modified code. It will, however, still be usable for normal functions, just like stock iOS. To start with a patched kernel, the user must start the device with the help of the jailbreak tool. A semi-untethered jailbreak gives the ability to start the device on it's own. On first boot, the device will not be running a patched kernel. However, rather than having to run a tool from a computer to apply the kernel patches, the user is able to re-jailbreak their device with the help of an app (usually sideloaded using Cydia Impactor) running on their device. In the case of the iOS 9.2-9.3.3 jailbreak, a Safari-based exploit was available, thereby meaning a website could be used to rejailbreak. In more detail: Each iOS device has a bootchain that tries to make sure only trusted/signed code is loaded. A device with a tethered jailbreak is able to boot up with the help of a jailbreaking tool because the tool executes exploits via USB that bypass parts of that "chain of trust", bootstrapping to a pwned (no signature check) iBSS, iBEC, or iBoot to finish the boot process. Untethered or semi-untethered jailbreaks are shown with a green 'yes'. Tethered or semi-tethered jailbreaks will be stated in a yellow box. Beta Firmwares are not listed here. ^ a b c d e A maliciously-crafted TIFF, using the libTiff Exploit, loaded into Safari, can be used to jailbreak iPhone OS 1.0-1.1.1. There are several of these TIFFs available - two of the most notable include planetbeing's and AppSnapp. However, both of these services are now offline, so cannot be used. Even so, a user could still create their own TIFF and payload in order to jailbreak 1.1.1, such as by following this guide. ^ It was previously possible to jailbreak 1.1.2 using OktoPrep alongside touchFree. However, the original package repository for OktoPrep through Installer.app has been taken offline. A user would need to find the original package file for OktoPrep and install it manually in order to jailbreak 1.1.2. ^ It was previously possible to jailbreak 1.1.3 using Soft Upgrade, but this is no longer possible due to the package repository being taken offline. A user would need to find the original package file for Soft Upgrade and install it manually to jailbreak 1.1.3 using this method. ^ Tethered for devices running the old bootrom only. Will not work for devices on the new bootrom (new bootrom devices cannot run iPhoneOS 2, only 3). ^ a b c d e f Tethered jailbreak for any iPhone 3GS with the new bootrom. Untethered for the old bootrom. ^ a b c Tethered jailbreak for any iPod touch (2nd generation) with the new bootrom. Untethered for the old bootrom. ^ Star can be modified to support 3.2.2, because Apple did not correctly patch the exploits used. ^ a b c Will only work for iPhone 3GS running the old bootrom. ^ a b Will only work for iPod touch (2nd generation) running the old bootrom. ^ a b c d An unofficial firmware bundle for this version must be manually added. ^ a b c d e f g h i j k l m n o p q Star can be modified to support 4.0.2-4.3, because Apple did not correctly patch the exploits used. ^ Tethered jailbreak for any iPhone 3GS with the new bootrom. Untethered for the old bootrom. Note: "Marketing Version" is the version that the Apple TV reports in its "About" screen. ^ a b No package management GUI. ^ a b A firmware bundle for this version must be manually added. ^ A firmware bundle for this version must be manually added. ^ No package management GUI. ^ a b c Tethered jailbreak on devices not vulnerable to 0x24000 Segment Overflow. Upgradable to untethered jailbreak via evasi0n Cydia package. ^ a b c d e f g h i j k l m n o Tethered jailbreak on devices not vulnerable to 0x24000 Segment Overflow. Requires pointing to 6.0 IPSW. Upgradable to untethered jailbreak via evasi0n Cydia package. ^ a b c d e f g h i j k l Tethered jailbreak on devices not vulnerable to 0x24000 Segment Overflow. Requires pointing to 6.0 IPSW. Upgradable to untethered jailbreak via p0sixspwn Cydia package. ^ a b c Tethered jailbreak on devices not vulnerable to 0x24000 Segment Overflow. Upgradable to untethered jailbreak via p0sixspwn Cydia package. ^ a b c d Point at 6.0 IPSW. 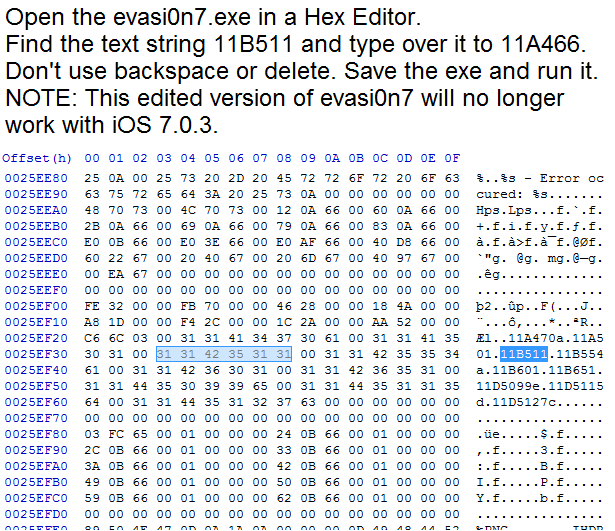 ^ a b c d e f g Due to the jailbreak payload being removed from the evasi0n website, a modified version of evasi0n7 is now required for a successful jailbreak. ^ Build 11A466. Requires a hex edit of evasi0n7 binary. See this image. ^ Tethered jailbreak. "Upgradable" to semi-tethered with "GeekSn0w Semi Untether Payload" (com.blackgeek.geeksn0wsemiuntetherpayload) from geekrepo.beiphone.it. ^ a b c d 1.0.0 and 1.0.1 give SSH access only (Cydia is not installed). ^ a b c iPad4,7 (Wi-Fi) only. ^ a b c d iPhone 5 (Global) (iPhone5,2) only. ^ a b c iPad mini (Wi-Fi) (iPad2,5) only. ^ a b iPhone 5c (GSM) (iPhone5,3) only. ^ iPad (3rd generation) (GSM) (iPad3,2) only. ^ a b iPad (3rd generation) (CDMA) (iPad3,3) only. ^ iPad (3rd generation) (Wi-Fi) (iPad3,1) only. ^ a b c d e f g h i j k l m n There is no Cydia included with this jailbreak, making it useless to the average jailbreaker.